Right now the shack consists of something old and something new. On the right, an old National SW-54 that I picked up recently on Ebay. This was the receiver that kept me up late nights as a kid and served as my intro to ham radio. I saw it on Ebay and had to get it. It's nice to have something with tubes in it! And on the left, the amazing shack-in-a-box, my FT-897. For an antenna, I use a long (300 ft or so) piece of #24 hookup wire. It runs out the window from my second floor shack and then around the yard in about a three quarter loop. It zigs and zags, goes high and low. Amazingly it works pretty nicely on all bands from 160m-10m with the help of the excellent AT-897 tuner. It even loads sometimes on 6M. I can't even guess what the radiation pattern is like. I have attic loops for 6M, 2M, and 432 but sadly there's not much activity there except for contest time. Now back to the beginning. I received my Technician license in 1968 when I was in eighth grade and was assigned WB2HEO. I really enjoyed 2 meters back in those days and had lots of fun with my old Clegg 22er. Worked 6 & 2 meters but missed out on the HF fun as I had bypassed the Novice ticket. 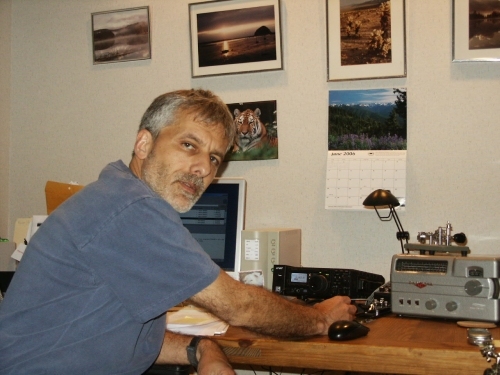 I upgraded to General and then to Advanced over the next couple of years and worked mostly all SSB on HF. I never really took to CW back then. I enjoyed building Heathkits, although I made quite a mess of the first kit or two, and needed some patient Elmers to help straighten things out. I got pretty good at it and built stereos and weather equipment along with ham kits. It was a sad day when Heathkit closed down. I was a music major in college (percussion) until I figured out that I wasn't talented enough to do much more than be a teacher, which I wasn't very interested in being, so I switched to Communications. After college, I worked for a few years as a Copywriter at Prentice-Hall and then at a local newspaper. I also lost interest in ham radio during my college years and sold off my equipment and took down my antennas. I did keep a 2-meter FM rig around. This would be my sole radio for the next 25 years or so. Every few years I'd drag it out of the closet, stick a magmount on some magnetic surface in the house, and make a qso or two. With much foresight, my Dad had gotten me an ARRL life membership so I continued to receive QST, and although I often hardly glanced at it, at least I had a monthly ham radio reminder. In the early '80s, I got into computer programming and spent six years working as a COBOL programmer, mainly on DEC PDP and VAX computers. Trying to stuff a COBOL program into the PDP's limited address space was an interesting exercise, and the implementation of virtual address space on the VAX was a wonderful thing. This was back in the days when 1MB of memory was a really big deal. On a personal note, my wife and I got married in 1981 (25 years goes by in a flash) and we have two children, Rachel and Ben. Somewhere along the way I traded in my call for a 2x2 and was assigned KD2MX, not a bad CW call, but with work, a house, and two kids, I had neither the time nor resources for ham radio. I then moved into doing system administration and got hired by Digital Equipment Corp. at the peak of their glory years. It was all downhill for the company but I spent some good years there delivering performance and capacity planning services before the bottom dropped out. For the past 13 years, I've been at a small computer/storage system integration firm here in North Jersey. We sell to and help large companies implement high-end systems. My computer background has been a big help to me getting back into ham radio as there is such a perfect marriage between these two technologies. Suddenly my kids were grown and in college. Ben is now at the University of Chicago and Rachel will be there next year as a grad student after working a year in the "real world". Since I now had lots of free time, I decided it was time to get back on the air. It's now been nearly a year since I took the plunge back into ham radio, after an absence of more than 20 years, and just over six months (or 1776! QRP QSOs) since I stumbled upon the November '05 NAQCC Sprint and worked K3WWP for my first QRP contact. I've had a ton of fun since and have been just amazed at what you can do with just 5 watts..all while painlessly solving your RFI problems. When planning my return to the airwaves, I decided to go the stealthy, minimalist route and after much investigation settled on the FT-897. I had neither the inclination nor such a great yard for a tower as I would've had to sacrifice a huge tree (no way). Even getting feedline out of the shack was a problem so I thought I'd try some an around-the-eaves wire. That turned out to be a RFI disaster, especially at 100 Watts, as just about every device in the house from the doorbell to the microwave lit up. The XYL was not happy. So I moved the wire away from the house and turned down the power. Seemed like a good idea to give CW a shot too. Fortunately, being a ham is like riding a bike. You don't forget, you just get a bit rusty. I'm finally getting the hang of CW now and I find it very satisfying. As far as ham radio in the 21st century goes, I still feel like a kid in the candy shop as there are just so many areas of the hobby to play around with. I think ham radio has so much more to offer today than it did 20 or 30 years ago. I've just started putting together a KX-1, my first building project in decades, and hope to be operating QRPp from the field soon. I've dabbled a bit with PSK and want to give working the satellites a shot. I've always found propagation fascinating, both HF and VHF, and as we know, that is the key to QRP. Despite all the complaining I see and hear about the sunspot doldrums, I've worked plenty of DX on all bands. Anytime you can work the other side of the world on 5 watts is a good time. I've even managed a few 6-meter DX QRP QSOs in the last week or so. I very much enjoy contesting and working the many CW contests over the past months has really helped me improve my cw skills. I'm still blown away by the super ops like the 30+wpm guys who work the WPX and the like. I don't know that my ears will ever get that fast. I really like our sprints, more laid back and you can use a straight key and not feel like you're really holding things up. I also enjoy a good ragchew and have been chasing some awards. Never even got WAS or basic DXCC so after 35 or so years as a ham I figure it is time so I'm collecting QSLs. I still like getting real, paper QSLs. Call me old-fashioned. Besides ham radio, I love to hike and I try and get out every weekend. Despite living in densely populated North Jersey, I am fortunate to have many miles of excellent trails within 15 minutes of home. After getting lost too many times, I bought a GPS awhile back and discovered geocaching, which is basically using your GPS to find things hidden by other geocachers out in the woods. It's a lot of fun and good exercise too. Check out www.geocaching.com. I originally thought I'd backpack my FT897 along but it is a bit much to haul around. The KX1 should be much easier to take along for the afternoon. 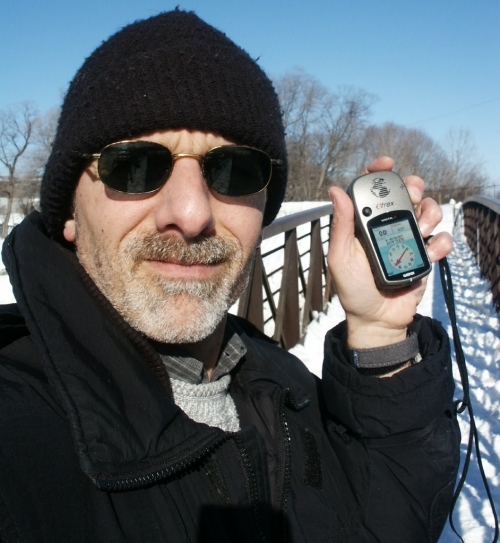 I've included a picture of me and my GPS out exploring last winter. Not quite as impressive a picture as the one of KI4DEF with the fish though. I still play some drums here and there, mostly in a local community orchestra. And I read a lot of non-fiction. I cover all topics but am especially interested in environmental and transportation issues, politics, science, and history. I'm now reading "New Jersey's Environment", which I recommend to all who think that all of NJ is like the very ugly NJ Turnpike corridor. I also walk dogs at the local animal shelter as our two cats made it very clear that they did not want a dog in "their" house. 73/72 to all and I look forward to many wonderful QRP QSOs in the years to come.